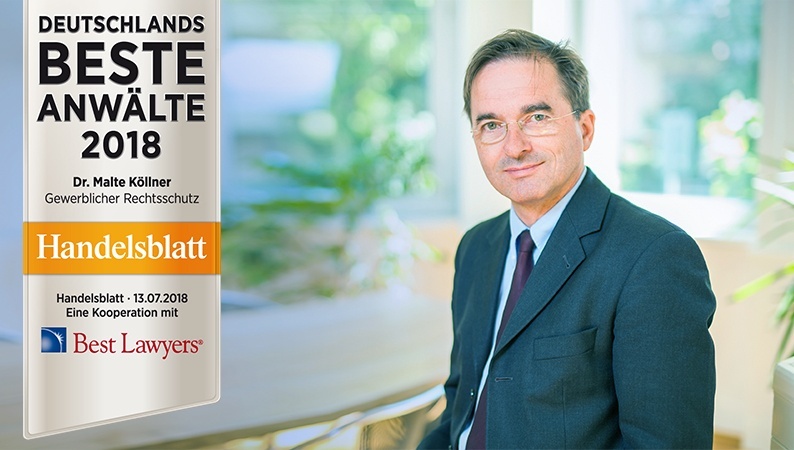 Dr. Malte Köllner from Dennemeyer & Associates has again been voted among Germany’s best lawyers. The ranking, conducted by the biggest daily German business newspaper, Handelsblatt, in cooperation with “Best Lawyers,” the oldest and most highly-respected peer review guide for the legal profession worldwide, is based on a peer-to-peer survey among thousands of German colleagues. Dr. Köllner is a German patent attorney, as well as European patent, trademark and design attorney, and has been ranked in the category “Gewerblicher Rechtsschutz (Industrial Property)” as being one of Germany's Best Lawyers 2018 for the third consecutive year. Dr. Köllner states: "The ranking 'Best lawyers' is the award that means most to me. Being named in this prestigious ranking among Germany’s leading Intellectual Property experts is an award that comes from my colleagues in Germany. It shows that my publications and lectures are recognized in the industry." Dr. Robert Fichter, Managing Director of the patent law firm Dennemeyer & Associates, adds: "Dennemeyer & Associates is proud to be ranked again. Handelsblatt is the most important German business paper, and 'Best Lawyers' is the most important peer review guide for the legal profession, also in Germany." Dr. Köllner holds a Ph. D. in Physical Chemistry and a diploma in Physics from the University of Heidelberg. His areas of expertise include physics, physical chemistry, optics, lasers, biotechnology, medical devices and software. With a vast experience in the field of Intellectual Property, Dr. Köllner furthermore acts as the editor-in-chief of the well-known German journal for patent law “Mitteilungen der Deutschen Patentanwälte,” and he is a lecturer at various conferences and universities, such as Strasbourg and Maastricht. His notable achievements in the IP area have, for several years in succession, listed him as one of the world’s leading lawyers and IP strategists. Dr. Köllner built up Dennemeyer’s services IP Monetization, Inventor Remuneration and Flat Fee Prosecution. Besides, he heads the service IP Due Diligence at the Dennemeyer & Associates’ office in Frankfurt.